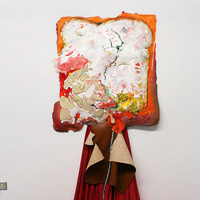 Studio left-overs, junk food, craft store oddities, urban detritus, and remnants of failed first attempts are all lowbrow materials incorporated into contemporary artworks appearing in The Tyranny of Good Taste, a group exhibition featuring 15 artists from across the nation. Producing artwork during a time of extreme economic turmoil, artists included have developed abnormally resourceful and strategically inventive means by which to produce uncommonly experimental art forms. Organized with an emphasis on the (counter-)productive time spent (or wasted) in an artist's studio, the maximalist and anarchic artworks in this exhibition challenge established fine art hierarchies of value and status-quo conventions of taste. This exhibition will be traveling to Charlotte Street's La Esquina gallery space following its run at Glass Curtain Gallery.